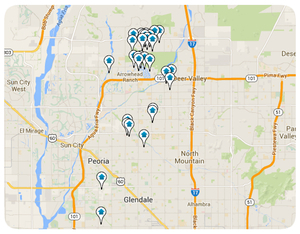 Sunny Glendale, Arizona is home to friendly neighborhoods, fine dining, shopping, sports events, music and more! Whether you enjoy passing the time at a sports game hosted at the University of Phoenix Stadium, rocking out at one of Gila River Arena’s headlining concerts, or Fine Dining at one of the many top rated restaurants around the city, you will never find a shortage of activity. Glendale’s business market is constantly expanding and commuters will find that quick access to the 101 Loop makes driving to any part of the valley easy. Listing courtesy of Jamal Abdallah.